The divine Constantine blossoms and dies. 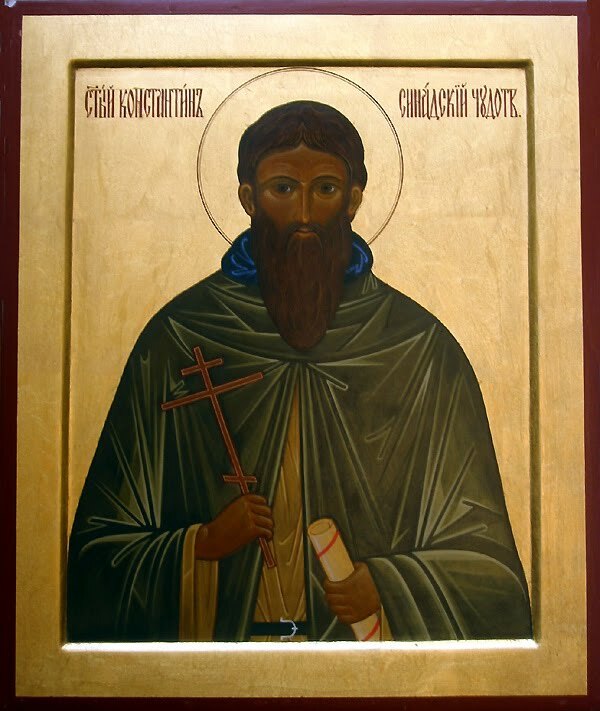 This Saint was from Synnada (which was a great and glorious city in Phrygia, honored with the throne of a Metropolitan, who had under him twenty Bishops), and was from the Jewish race. * When he was very young, he was following his mother and saw a Christian who made the sign of the honorable Cross over his mouth when he yawned. From that time he also would do the same, in imitation of the Christian. Not only this, but he would do other Christian acts with fervent faith. For this reason his face shined with a divine radiance. He was taught about God along with Christian doctrines, and he spent a period of some days fasting. Once a Jewish girl leaped on him in the manner of a harlot. The Saint made the sign of the honorable Cross, which brought death to her, but he raised her from the dead. Led by a divine cloud he was guided to a Monastery called Phlouboute. ** There he found magnificent men, who applied themselves to the ascetic life so that the virtues shined from them. After being brought to the Abbot of the Monastery, a Cross was ordered to be brought. Then the Abbot ordered him to venerate and kiss it. When the blessed one kissed the bottom of the Cross with fear and reverence, then, - O the wonder! - the entire Cross leaned onto his venerable head, and the form of the Cross was marked on it. This remained always on his head until he reposed. Then, after receiving Holy Baptism, he was named Constantine. *** This was followed by something wondrous. On the stone slab on which he stood, after he emerged from the holy font, his footprints incredibly made an impression. This was followed by him entering into spiritual battles, from which the renowned one was victorious, and he exceeded all the monks of the monastery in hard work and asceticism. His occupation consisted of the work of the Apostle Paul, for he sewed skins of leather and fashioned tents. When he would pray, the entire area would become fragrant. When he would go to the church, the doors of the temple would open by his word. From the exceeding purity that he had, he was able to noetically see the hidden thoughts of the brothers. * His anonymous life was written shortly after his death, during the reign of Emperor Leo VI (886-912), and tells us much about Jews at the time in the area of Nicaea. ** This was in Nicaea. He remained there for approximately twelve years. *** In honor of Emperor Constantine the Great, who also was converted by a miracle of the Cross. **** He put his efforts to the conversion of Jews in the wider area of Nicaea but, after receiving threats from the Jewish community, he left for Olympus of Bithynia with the wish to lead a monastic life. ***** Between the years 883-886 he traveled to Constantinople, met the emperor Basil I and made efforts to reconcile him with his son Leo, the future emperor Leo VI (886-912), who was accused for conspiracy. ****** He died on December 26th of some year after 896. With the rivers of your tears, you have made the barren desert fertile. Through sighs of sorrow from deep within you, your labors have borne fruit a hundred-fold. By your miracles you have become a light, shining upon the world. O Constantine, our Holy Father, pray to Christ our God, to save our souls.